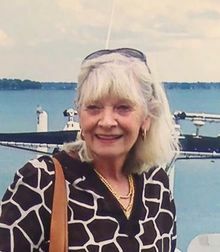 DONNA M. VARGO 80, passed away peacefully following a brief illness on Monday, February 18, 2019, in her home in Avon Lake, Ohio. She was the loving mother of Kristen Walter and Cortney Martin; grandmother of Evan (Kim), Kendall, Olivia, Ana Walter and Spencer and Grant Martin, and the great-grandmother of Nora Walter and Nora's expected baby brother. She was preceded in death by her devoted and loving husband of 55 years, Ted, as well as her siblings Marilyn Burger, Norma Williams, and Dan Grady. She is survived by her sister Sharon Bracci. Donna was born in Detroit, Michigan, moved to Johnstown Pennsylvania, and attended Seton Hill College before starting a family. Donna was force to be reckoned with on the tennis court and forged enduring friendships through the sport. She liked her clothing, furniture, and cars all white, and her flowers very bright! She was a talented and thrifty decorator who put out a steady stream of love-infused refinished furniture, sewn goods, and accessories for her children and grandchildren. She had artistic talents, a great eye for design, and was a calligrapher. She was a loyal friend, witty and sensible, who offered wise counsel to so many. She will be sorely missed. She liked things simple, and per her wishes, there will be a private family visitation only.